Blurb: Murder most foul or an open-and-shut case of routine suicide? Being an editor and an author have many perks. One of them is that you get to read your author friend’s story before they reach other regular readers, before the book hits the stores. When Ganga Bharani asked me whether I would do a pre-release review of her second book (the book releases on July 23, 2015), I was more than happy to agree. a) Ganga Bharani writes amazing thrillers unlike any other Indian writer. I have come to know this from her debut book, Just You, Me and a Secret. This book did not disappoint me at all as well. b) It is an honor to be among the first who reads a book which is surely going to win many hearts, and bring many laurels to Ganga Bharani. The book is just above a hundred pages long and is written in a no-nonsense manner without any unnecessary spice or cheap thrills. The lucid narration and story grips the reader right from page one. I was able to finish reading it within a few hours. Thrillers are not my favorite genre but romance is. 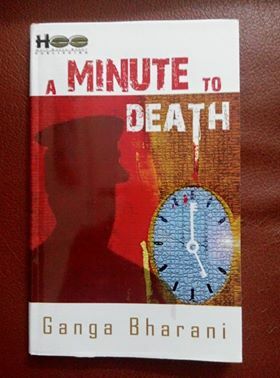 ‘A minute to Death’ has a subtle undercurrent of a romance and yet it has all the essential elements of a fast paced thriller as well. So I didn’t have anything to complain. It was a few hours well spent. Riya, the aspiring writer, quite the tomboy, comes out as an endearing character. Rohan with his intelligence, his charming persona and firm values comes across as a person anyone would love to have as a protector or friend. Every chapter ends with suspense or a new clue, making the reader turn the pages twice as fast than normal. What I liked most was that there was not a single moment of inaction in the entire book. No unnecessary digression at all. Every page has its importance and you just can’t skip reading even a few lines. The crisp narration does justice to the entire story. You just have to read the book to know exactly what it is that makes it an enchanting read. Okay, Okay, I will give out just one clue! ‘A minute to death’: Yes that itself is a BIG clue. Now, Dear reader, go pick the book and read! Oh! I forgot, you have to wait! The book releases only on July 23rd 2015. One question to the author: Dear Ganga, you ended the story too soon. The romance reader in me wants to know more about Rohan and Riya’s love story. Can I expect a love story with the same characters next (wink, wink)?